Following a disappointing May employment report, the Bureau of Labor Statistics updated its estimate for worker productivity in the first quarter. Hours worked rose more than output in the first three months of the year, resulting in a decline in productivity by 0.6%. Wages grew as hours increased. While costing employers more, higher pay eventually could encourage more consumer spending. Consumer spending accounts for more than two-thirds of the U.S. gross domestic product, so analysts were encouraged to see credit card debt increase in April for the third month in a row. 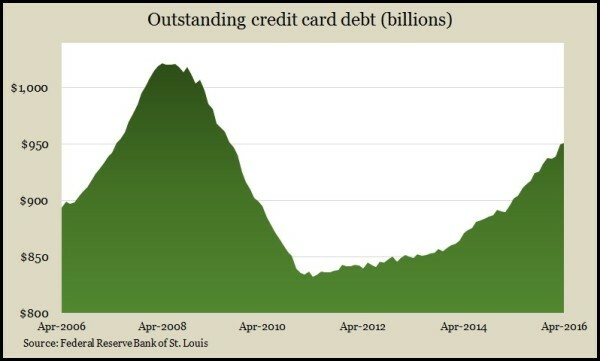 Despite a recent upward trend in credit card use, the Federal Reserve data show total revolving debt – as it’s called – is still nearly 7% below its peak set just before the financial crisis eight years ago. Employers tied a record set in July for the most job openings posted – 5.8 million in April, according to the Bureau of Labor Statistics. But the number of employees hired declined for the third time in four months and the rate of hiring dropped to its lowest level since August 2014. The rate of workers quitting their jobs also dropped off, suggesting workers are feeling less confident about the job market. The moving four-week average of initial unemployment claims fell for the second week in a row, remaining near a four-decade low. A persistent lack of jobless applications suggests employers are reluctant to let workers go, which also could eventually lead to wage increases. Based on Labor Department data, jobless claims have been below the 48-year average every week for more than three years. Lower-than-expected levels of wholesale inventories lagged sales growth in April, according to the Commerce Department. As a result, the ratio of inventories to sales narrowed, indicating businesses are operating leaner, though they’re still at levels last seen during the 2008 financial crisis. A preliminary indication of consumer sentiment for June showed Americans feeling better about their own financial situations but less sure about the overall economy in the months ahead. The survey, from the University of Michigan, indicated the highest sentiment in 12 years toward current conditions and the most optimism about personal finances since before the recession. An economist with the university said the index suggests above-average consumer spending both this year and next.